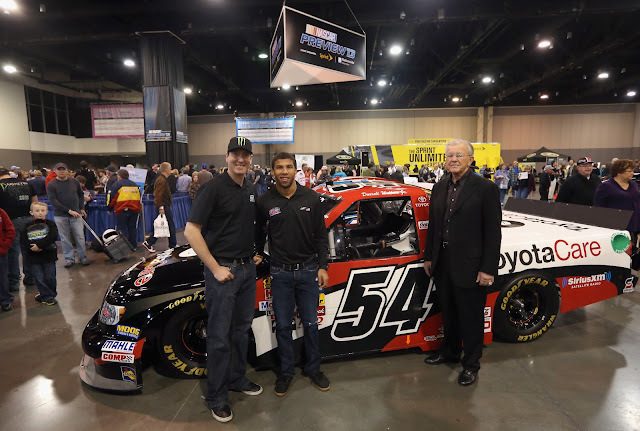 (L-R) Kyle Busch, Darrell Wallace Jr. and Joe Gibbs of Joe Gibbs Racing announce that Wallace will drive in the NASCAR Camping World Series during the NASCAR Preview at the NASCAR Hall of Fame on February 9, 2013 in Charlotte, North Carolina. HUNTERSVILLE, N.C. (February 9, 2013) – Joe Gibbs Racing (JGR) announces today that Darrell Wallace Jr. will run a full season schedule in the NASCAR Camping World Truck Series behind the wheel of the Kyle Busch Motorsports No. 54 Toyota Tundra. Wallace has impressed at each level he has competed and 2013 will mark the first time he will race in the truck series. Last year, the 19-year-old made his NASCAR Nationwide Series debut with four starts that included three top ten finishes and his first pole award at Dover International Raceway. Wallace spent three seasons competing in the NASCAR K&N Pro Series East from 2010-2012. He would make history when in the first race of the 2010 season he became the Series’ youngest and first African American to win a race at Greenville-Pickens Speedway. Wallace would also earn Series’ Rookie of the Year honors that season. Joe Gibbs Racing (JGR) is one of the premier organizations in NASCAR, currently fielding three NASCAR Sprint Cup Series teams, three NASCAR Nationwide Series teams and a driver development program. Its driver lineup consists of Denny Hamlin, Kyle Busch and Matt Kenseth in the Sprint Cup Series, while Brian Vickers and Elliott Sadler joins those three in the Nationwide Series along with Drew Herring and Darrell Wallace, Jr. Wallace will also run a full season in the NASCAR Camping World Truck Series with Kyle Busch Motorsports. Based in Huntersville, N.C., and owned by Joe Gibbs – a three-time Super Bowl winner as head coach of the Washington Redskins and a member of the Pro Football Hall of Fame – JGR has competed in NASCAR since 1992, winning three Cup Series championships, and four Nationwide Series owner’s championships along with more than 175NASCAR races, including three Brickyard 400s and the 1993 Daytona 500.